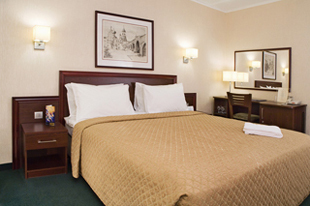 Business-hotel AEROSTAR is located in one of the main Moscow highways — Leningradskiy Prospect, connecting the international airport Sheremetyevo to the historic city center. Only 10 minutes separates hotel from Kremlin. It takes 15 minutes to go to International Business Center Moscow-City, to the exhibition center Expocenter and to WTC Moscow. You could reach airport Sheremetyevo and exhibition center Crocus Expo in half an hour. Within walking distance there is Ice Palace on Khodynka Field, stadium Dinamo and CSKA sports complex, as well as metro station Dinamo. The northeast side of the hotel gives onto Petrovskiy palace, built by Catherine II as a royal residence for rest after exhausting trip from Petersburg to Moscow. Floor space of each room — 14 sq.m. Room equipment: 2 beds 90x200 cm or 1 bed 180x200 cm; 2 bed-side tables, desk, armchair, chair, wardrobe, luggage-stand, big mirror, a coat rack. Room facilities: Air-conditioning, Satellite/pay TV, Internet access; Minibar, Safety box; Electronic lock; Bathroom with a bathtub, hair-dryer, cosmetics kit. 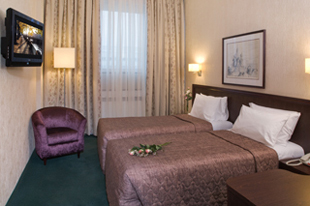 The room rates include VAT, full buffet breakfast and free access to the fitness-centre. Room equipment: 2 beds 90x200 cm or 1 bed 180x200 cm; 2 bed-side tables, separate working area, 2 wardrobes, trouser press, luggage-stand, big mirror, a coat rack, sofa, coffee table, armchair. 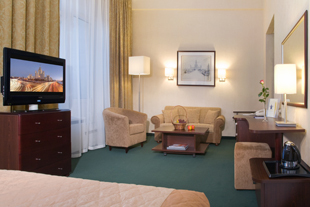 Room facilities: Air-conditioning, Satellite/pay TV, Internet access, Minibar, Safety box, Tea Maker. Bathroom with a bathtub, hair-dryer, cosmetics kit, bathrobe, slippers. Forum participants should make hotel reservation via Personal Online Office after Online registration process.